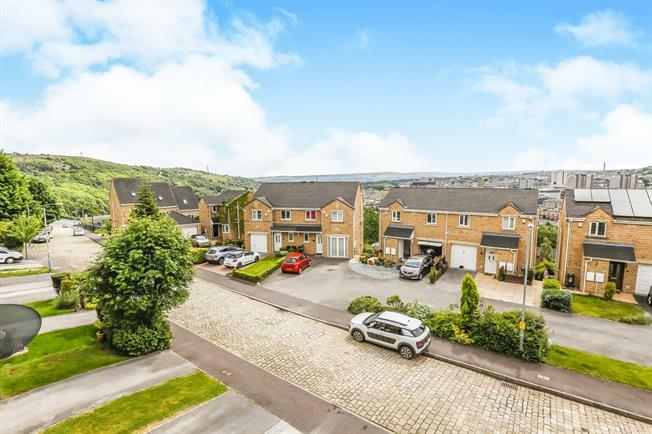 3 Bedroom Terraced House For Sale in Halifax for Offers in the region of £165,000. Situated in this elevated and commanding position enjoying stunning views over Halifax and the surrounding area lies this beautifully presented three bedroom family home, superbly appointed providing spacious accommodation which briefly comprises, an impressive open plan dining kitchen, conservatory, lounge, downstairs cloakroom/W.C, integral garage, three good sized bedrooms, modern bathroom and an attractive decked/patio garden ideal for entertaining, the property further benefits from UPVC double glazing, gas central heating and a driveway, viewing is highly recommended. A really good size lounge with Juliet doors with stunning views over looking Halifax, radiator. A well presented dining kitchen with doors leading into the conservatory, modern wall and base units with a range of integrated appliances, radiator, gas central heating boiler, double glazed window over looking the rear. Radiator, views over looking the garden. The main bedroom is located to the front of the property with stunning views over looking Halifax, radiator. Radiator, double glazed window over looking the rear. Internal bathroom, extractor fan, Modern three piece suite with low flush WC, hand basin. The property benefits from an integral garage which has a separate workshop to the rear which could be useful for a variety of things.